DPS Board Member Arturo Jimenez contributed an Op-Ed to Sunday’s Denver Post in which he explained his rationale for opposing the upcoming Bond. Mr. Jimenez stressed that the largest problem he sees in DPS is the chronic underachievement of Denver’s low-income students. Fair enough – few people would argue this point. But then in a contortion that Cirque de Soleil would find difficult to pull off, Jimenez cites as his primary opposition to the bond that it includes too much money for charter schools. Now I find it odd to conflate issues of school performance to a debate over a bond for capital expenditures. At best, this is a tangential argument — one can believe that DPS is educating children well, or poorly, and still support spending for school construction, renovation, and equipment. In a district where 60 percent of the student population receives free and reduced lunches, the biggest deterrent in providing a stellar education to our children is poverty. Jimenez stresses that he cannot support the bond in large part because it does not fix this and related problems. Instead, he claims, the bond includes too much money for charter schools. So these charter schools which Jimenez opposes must be doing a really poor job with low-income students, right? Well, no. Untangle his twisted position, and the truth is exactly the opposite: for charter schools in Denver are vastly outperforming their traditional peers for academic outcomes, particularly for low-income kids. Before we dig into the numbers, accept first that charter schools in Denver serve pretty much the exact same student demographics as traditional schools. They may be elite in their accomplishments, but not in their student bodies. I’ve written on this recently at some length, and these pesky facts on charter and traditional school populations have been consistent for years. 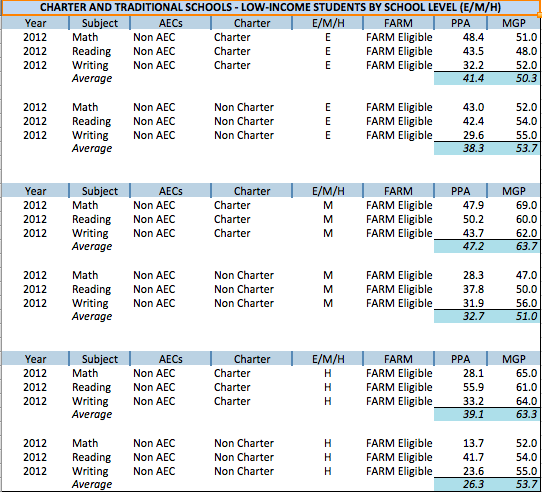 So how do charter and traditional schools compare? In 2012, charter schools in Denver performed better than traditional schools in both the percentage of students who were proficient or advanced (PPA), and in academic growth (median growth percentiles, or MGP). This difference was substantial: 6.8 percentage points in PPA and just over 7.3 points in MGP. This is for all students. What happens when we look just at students that form the crux of Mr. Jimenez’s concerns: students in poverty who meet the requirement for free and reduced meals (FARM, or often referred to as FRL). The difference grows even wider. For low-income kids in charter schools in Denver do fully 10.5 percentage points better in proficiency, and 8.7 points higher in growth, than their peers in traditional schools. What is even more revealing about these numbers is that there are very few charter schools serving elementary school kids — which is where traditional schools tend to see their best results. Want to look at how low-income kids are doing in secondary grades? At the middle school level (grades 6-8), charter schools perform an astounding 14.6 percentage points better in proficiency and 12.7 points better in growth. This diminishes only slightly at the high school level, where charter schools perform 12.8 percentage points higher in proficiency and 9.7 points better in growth. Still think that objecting to a bond because it spends money on charter schools is the way to help low-income students? Pretty twisted logic. Let’s take a related look at the recent DPS School Performance Framework (SPF). Now oddly enough, my earlier analysis of SPF results has been cited as a reason to oppose the bond. But guess what happens if you untangle the contortionist position and extend this same analysis – cited by critics of the bond – to charter schools. For if poor academic outcomes are a reason to vote against the bond, presumably one should support the schools which are showing positive academic outcomes. Right? On the 2012 SPF, fully 25% of all charter school students are in the highest category of “distinguished” schools. Just 5% of students in traditional schools can make the same claim. Of the 25 charter schools in the SPF, 7 (or 28%) are distinguished, compared to 8 (or just 7%) of the 120 district schools. That’s a pretty big difference. And how are these respective schools doing serving the low-income kids about whom Mr. Jimenez is most concerned? Well, of the seven distinguished charter schools, all but one serves a percentage of low-income kids equal or higher than the district average. Of the eight distinguished traditional schools, just two can make the same claim. Half of the traditional schools in this august group have less than 10% low-income kids. In contrast, the charter with the lowest percentage of low-income students is still higher than all but two of the traditional schools. The SPF also shows how achievement in traditional schools are skewed to early grades. How many distinguished charter schools serve students in grades 6-12? Every single one. How many distinguished traditional schools serve secondary grades? Just two (one of which is a K-8 with just 8% low-income students). Is the problem with low-income student achievement that charters might receive bond dollars? Maybe if your head is where another body part resides. Look, one can decide to support or oppose the DPS bond on all sorts of criteria, logical or not. Charters are no panacea – quality is far more important than school type. But you cannot now in Denver both claim that you want better academic outcomes for low-income students and oppose the city’s charter schools without twisting oneself into logical knots. 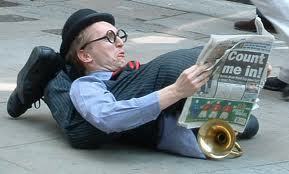 Unfortunately, this contortionist position is all too familiar to Mr. Jimenez. Addendum: For data junkies, the charts follow, and unlike some of the machinations in Mr. Jimenez’s calculations, this is all public data that can be easily replicated from the CDE Data Lab. Note that I have exempted all students at Alternative Education Campuses (AECs), as is clear in the data that follows. This entry was posted in Charter Schools, District Performance, Fiscal & Economic, Poverty, School Performance. Bookmark the permalink.